Nuno Espirito Santo described Wolves' third consecutive Premier League win as a "very special" achievement after their comfortable 2-0 victory over Bournemouth at Molineux. 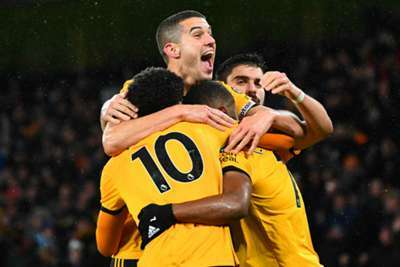 Wolves followed up triumphs over Chelsea and Newcastle United with another on Saturday, courtesy of goals from Raul Jimenez and substitute Ivan Cavaleiro. In wet conditions, the hosts surged up to seventh in the table and Nuno spoke of his pride after sealing three straight wins in the competition for the first time in their history. The run has come after a six-match winless streak that lasted two months. "I'm very proud of the boys," Nuno said at his post-match media conference. "They put in the hard work to make it possible. I'm happy for our fans because we achieved something very special in the most difficult competition in the world. "I truly believe that you have to take things as they come and keep on going and keep on believing in the daily work - the way you want to do things, how you play. They were difficult moments [during the winless run] but we kept on believing. "Sometimes those moments make you think more and find a better solution. The boys' character and acceptance of things was amazing. Even bad moments can make you stronger. We were in a bad moment. Now we're in a good moment. It's important to realise why. "The boys' character, the way they commit to the work on a daily basis, well done to them. What gives us the heart is that we are trying to build something together, not just from now. Last season we didn't look at the table and we were in the Championship. Now we are in the Premier League why would we change? "The clean sheet was very important. It was cold wasn't it!? In this weather, with the wind, cold and rain and against Bournemouth - I'm very proud. Credit to everyone, especially the players on the pitch - it was very hard to play football for both teams. People who love football love these games." Three consecutive @premierleague wins for the first time in Wolves' history. What a couple of weeks. Bournemouth are trending in the opposite direction, now 11th in the table having lost six of their last seven matches, with Eddie Howe calling on his team to show guts despite suffering with injuries, Tyrone Mings the latest to go down in this game. Howe told BBC Sport: "We've got to be very strong, show big character and come through this bad form. "Confidence is such a delicate thing. You can't overestimate the importance of losing key individuals [to injury]. But that's no excuse, that's what you have a squad for. "You don't like losing and the players here have done so well historically at bouncing back when we've been out of form, and that's the challenge again. "We keep seeming to lose players through injury, especially during games as well. There's no other way around it, we need a win and a performance to get back on track."